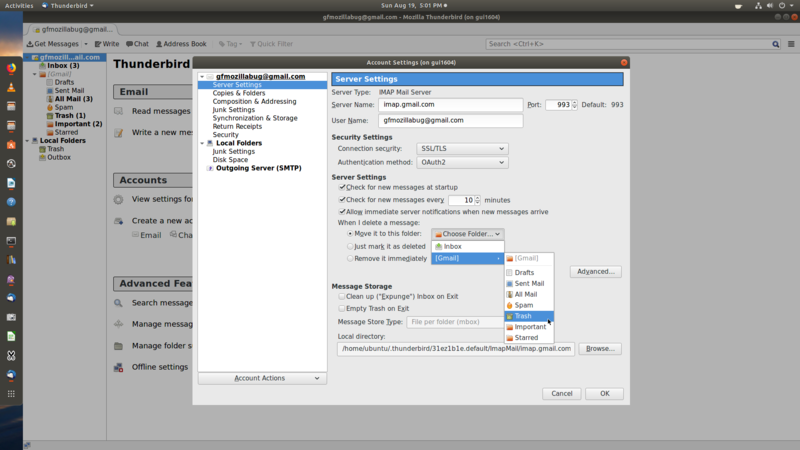 On Ubuntu Precise 64 bit using Thunderbird v17.0.8, deleting a message (on Gmail account using IMAP) from Inbox, the message is not moved to the Deleted folder but is removed completely. dmi.chassis.vendor: Gigabyte Tecohnology Co., Ltd.
dmi.sys.vendor: Gigabyte Tecohnology Co., Ltd. This is still a problem on Thunderbird 52.8.0 64 bit..
[24718:24718:0706/200731.108080:ERROR:zygote_host_impl_linux.cc(88)] Running as root without --no-sandbox is not supported. See https://crbug.com/638180. [24731:24731:0706/200731.293842:ERROR:zygote_host_impl_linux.cc(88)] Running as root without --no-sandbox is not supported. See https://crbug.com/638180. [24757:24757:0706/200731.876044:ERROR:zygote_host_impl_linux.cc(88)] Running as root without --no-sandbox is not supported. See https://crbug.com/638180. [24767:24767:0706/200732.063199:ERROR:zygote_host_impl_linux.cc(88)] Running as root without --no-sandbox is not supported. See https://crbug.com/638180. In your server settings, do you have the "leave messages on server" box checked? I have that checked (see screen shot) and I am having a similar problem with my Thunderbird. I delete a message and nothing happens. Then I close TB and start it again. Then the message I deleted has disappeared and not gone to either trash bucket. There are lots of similar reports from that time but I am surprised not to see any from current years. Just trying to narrow it down. 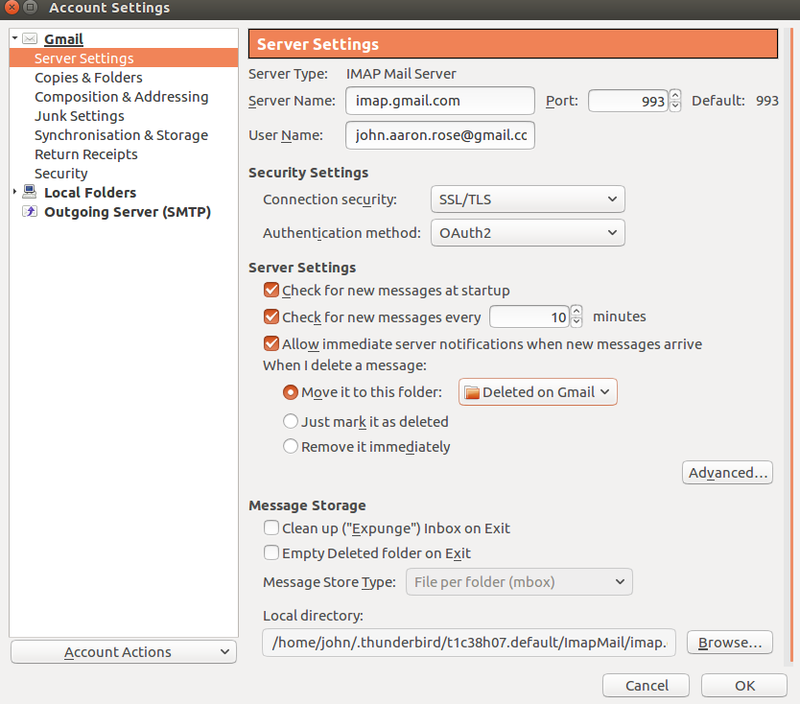 (a) Use "move from IMAP folder to local mail folder" insead of "Delete". (b) Use "Archive" as your "Delete", with "Archives == local mail folder". To do workaround option (b), you have to set your archived messages to go to the local trash folder. Halfway down on the right side is the "Message Archives" section shown in the screen print. In my server settings, I do you have the "leave messages on server" box checked I'm reluctant to change that as sometimes: I delete a message by accident, or later I realise that I shouldn't have deleted it. When I do either of those deleted actions, that results in the message being properly deleted rather than going to the Deleted folder. Messages still being on the server allows me to recover that message easily as still in All Mail on the server. Also, sometimes I move a message from Inbox (I always try to keep an empty Inbox) to another folder but which is the wrong one, usually because I've had finger trouble when doing drag & drop on the message from the Inbox to the appropriate folder. Then I can find the message relatively easily in he Server's All Mail (compared to trying to find it one of my approx 70 folders and put it in the correct folder. I have tried the workaround of moving it to the Deleted (I don't think that I created that folder i.e. it was created by Thunderbird when I installed Thunderbird) folder in "Local Folders". That didn't work because the Drop Down box (in Account Settings -> Server Settings) with "Move it to this folder" radio button set does not show any Local Folders: I couldn't show that on a screenshot because the Screen shot wouldn't let me do so! Of course, even if this 'move' was able to work, it still doesn't solve the problem of putting the message in the wrong folder. I'll just have to get better at doing Drag & Drop! PS it really is about time that Mozilla corrected this bug. PPS there's also the problem that the suggested apport-collect command hangs. Should I open a bug report on that? If so, how do I report it? PPS there's now a new bug in Thunderbird in that the automatic Junk mail facility now doesn't work for one of my regular Junk suppliers. 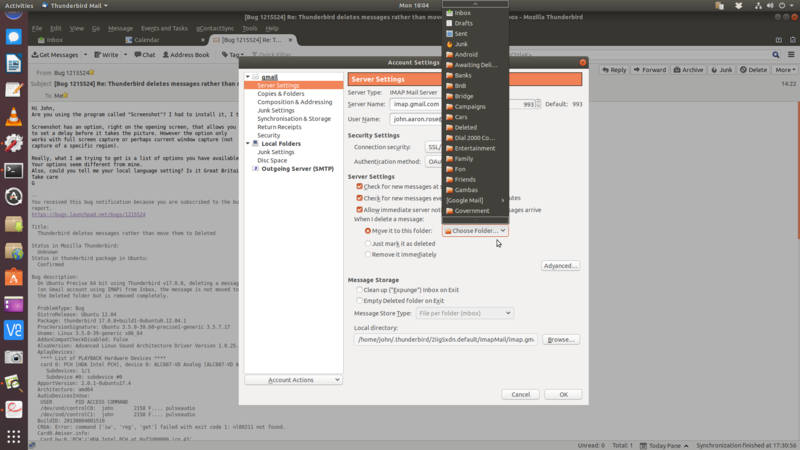 Is it possible for Ubuntu to move to a better version of Thunderbird than this 52.8.0 version? TB 52.9.1 on Ubuntu 18.04. Message should be moved to the trash folder immediately upon clicking "Delete Message"
Also, if you have a filter applied (eg. 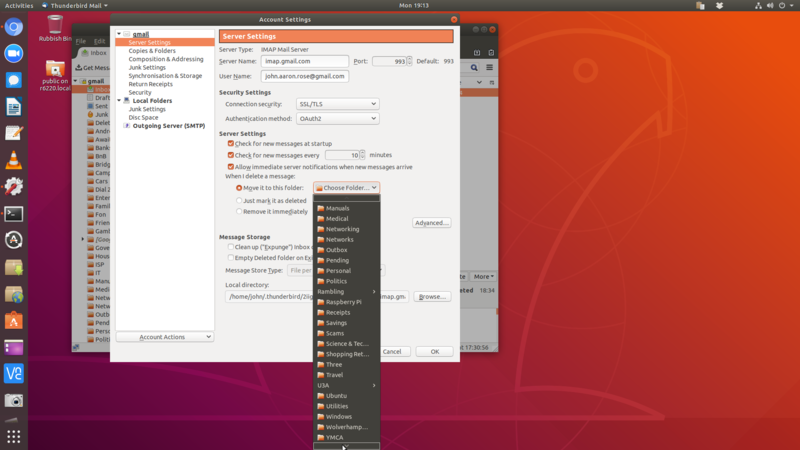 type ubuntu-news in the search bar), the right click on one message, selected "Delete message," it marks it as read (not bold anymore), then it stays there even after restart of Thunderbird. And the filter is still applied. Expected results: the deleted message should be in the trash folder. And when TB starts up, there should be no filter applied. This is as far as I can go on this ticket. I hope they action it or provide a workaround soon. so this doesn't happen if "Leave messages on server" is unchecked ? Thanks for following up. I believe that is the case, yes. I now have various versions of TB set up in containers and will test this with the beta version. And I will test this with a dummy account, with the "leave messages" box checked and unchecked to make sure. I will provide update as soon as I test this. Just to give you an update. The Mozilla are looking at it. I have had a question from them asking for more clarification on this yesterday.I will test it on the beta version shortly. As far as I can tell, the "leave messages on server" option is specific to a POP account setup. I have tried to set up my testing Gmail account on Thunderbird60 as a POP account but gmail won't let me. I have the gmail account set up as an IMAP account, no problem. It let me set up a second account with the POP settings but gmail would not accept the password. I don't know how to find another email address that I can set up with POP. I don't want to try this on my real account because I don't want to uncheck the "leave messages on server" box with my thousands of messages. I truly want to keep them on the server. I am stuck regarding testing this ticket further. I tried to set up a testing Yahoo account but they insist on having a mobile number. What else can I do for you on this? Hi John, I have tried to set up a POP account in testing but am unable to do so. This is as far as I can go on this. I will keep an eye on this and the accompanying Mozilla bug report. Hopefully they can include a fix in the next version. BTW I use IMAP not POP. I am new to this and I can't seem to find it. I don't know about the "leave message on server" option. However, In Edit -> Account Settings -> -> Server Seetings, the option is set for "When I delete a message", "Move it to this folder" "Deleted on gmail". OK, John, I will look at trying to do the same in the latest version of Thunderbird. Hello John. I have tested this with a testing GMAIL account on the Thunderbird 60 (latest version - manual testing upgrade) and version 57.0b2 (available through beta upgrade channel). In these two versions, the deleted emails go correctly to the trash bin. Could you also tell me what version of Ubuntu you have? Hello Wayne. Just an update on testing done on this ticket. Reporter says he is on IMAP not POP and, under server settings, has deleted emails set to move to Gmail trash. I have tested this with a Gmail account using IMAP and above settings on TB v60 and TB v57.0b2. In these two versions, the deleted emails go correctly to the trash bin in Gmail. Awaiting further info from bug reporter. I have Ubuntu 16.04 with T'bird 52.9.1 on 2 PCs and Ubuntu 18.04 (clean installed) with T'bird 52.9.1 on the other. All have same problem. None of them have a Trash folder. All have a Deleted folder created by T'bird (i.e. not by me). Your statement about the settings is correct except that I selected Deleted on Gmail for the 'Move to folder': note that this is not the Bin sub-folder in the Googlemail (i.e. server) folder. I think I am narrowing it down. I see the difference between your 'Move to folder' settings and mine. I realize you already attached a screen shot of the server settings screen. Could you take a new screen shot of the server settings with the drop-down lists shown? See attached example from my computer. To take screenshots, I use a program called "screenshot" and set it to "Grab the whole screen" and "Grab after a delay of" 5 seconds, and check the box for "include pointer." Hope this helps. Reporter has TB version 52.9.1 installed on several PCs under both Ubuntu 16.04 and 18.04. Same problem on all computers. Server settings, “When I delete emails,” “Move to folder” setting options on his computer are different from my test versions. See attached original screen print from reporter, and my own screenprint from TB60. I have asked reporter to provide new screen print with server settings dropdowns shown. Thanks for looking at this, Wayne. From the bug triager computer (GF), on Thunderbird v60. does not have it on). > I think I am narrowing it down. > I see the difference between your 'Move to folder' settings and mine. I realize you already attached a screen shot of the server settings screen. > Could you take a new screen shot of the server settings with the drop-down lists shown? > See attached example from my computer. > the box for "include pointer." Hope this helps. > ** Attachment added: "TB52.9.1 Gmail Server Settings on Ubuntu1604_Bug Triager Computer"
Are you using the program called "Screenshot"? I had to install it, I think. Screenshot has an option, right on the opening screen, that allows you to set a delay before it takes the picture. However the option only works with full screen capture or perhaps current window capture (not capture of a specific region). Really, what I am trying to get is a list of options you have available in the "when I delete messages" drop down list. Your options seem different from mine. Also, could you tell me your local language setting? Is it Great Britain, by any chance? It was stupid of me to forget about the delay option. Screenshot attached. Hi John. Thanks for the screenshot. That's very interesting. That's not the whole list, is it? You mentioned it was "Deleted" folder, not "Trash" - could you upload a screenshot of the part of the list that shows that? I would like to pass that on to the Mozilla group. Is there also a "Trash" folder in your Gmail, as opposed to "Deleted"? Also, what are you local language settings? Is it Great Britain? Rest of gmail Server Settings attached. No Trash folder. Local Language (in Ubuntu & T'bird Spell Checker) is English Great Britain (GB)/ United Kingdom (UK). Thanks for taking the time to post another screen shot for me, John. I will forward your two screen shots to the Mozilla programmers now. I think we are narrowing it down. I suspect that it might be because your deleted folder has the name "Deleted" instead of "Trash" but I am not a programmer and Thunderbird is all new to me. I will let them poke away at it but I will keep an eye on this ticket and keep in touch with you. Reporter has submitted two screen shots showing all his Gmail folders. Note: none of them are named "Trash"
There is one called "Deleted"
Reporter's local language settings are Great Britain. I thought this might be because of the local language settings, but maybe not. Could the problem be due to the different name for the trash folder? I will post the two screen shots just now. Thanks for your help on this, Wayne. I forwarded your two screen shots to the Mozilla programmers in their bug tracker (link is in comment #9 above). Hopefully, they will action it soon. Though, I must advise that it may take a long time for them to action it, as the programmers themselves are also volunteers. Thank you for your patience. I will keep an eye on this ticket to watch for progress. I see no problem deleting messages to Trash with my Gmail IMAP account, or any of my 2 POP3 accounts using TB 52.9.1 from Ubuntu on Ubuntu 18.04. His screenshot doesn't show what folders appear under the Google Mail folder tree when expanded. That is where my Trash folder is located. I also have no problem with TB 60.0. I will ask the user for a screen print of the folders under the google mail folder tree. Thanks for looking into this and other tickets, this afternoon. The Mozilla team have tried to replicate your problem and can't so far. Could you attach screen print(s) of your GMail list of folders? It might have to be two screen prints since it is such a long list. The Mozilla tech says that is where his trash folder is. I've already attached screen prints of my Gmail list of folders in my Comments #9 & #22. Please clarify what you want. My apologies, John. I see you are correct. I will forward the two screen shots to the Mozilla team. I have the two screen shots from the user. The list of folders is so long, it had to be two screen shots. Does this issue still reproduce when using a current version? Hi Wayne. I am sorry for the slow response to your info request. I finally have time to get back to this. I used to be able to just unzip the tarball, go into the extracted directories and double click on the file named Thunderbird inside the directory and it would run. Now I get an error (attached screen shot). I am sorry but I am unable to test this. You should probably close this ticket. Take care and thanks for following up on this ticket. I also tried that recently and saw the same Error message. I'm pretty sure the application launched when I clicked the thunderbird-bin file. I never have trouble when using a Terminal and use ~/test/thunderbird/thunderbird -p to open the profile manager. Do we have a bug report "no application installed"? Or do we think it is not a Thunderbird problem? I think you might have an "app not install" problem, but I am no expert. Attached is a doc of my steps. Walt: thanks for your comment - with your instructions, I was able to run it through terminal. I have included the terminal output in the attached. Wayne: I will try to test the issue for this bug report later today or tomorrow. > Do we have a bug report "no application installed"? Or do we think it is not a Thunderbird problem? Created bug 1545795 which has the details what needs to be ported to fix it. > I think you might have an "app not install" problem, but I am no expert. > Attached is a doc of my steps. > Walt: thanks for your comment - with your instructions, I was able to run it through terminal. I have included the terminal output in the attached. I always start test builds with a command that includes the -p switch to start the Profile Manager because I use many profiles to test various problems and other things. I have tested this bug report (Delete does not move message to trash) in Thunderbird beta 67.0b. The emails are properly moving to the deleted folder when they are deleted. Please close this ticket as it is resolved.